After heating and cooling, water heating is typically the largest energy user in the home because it is necessary for so many domestic activities. 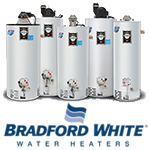 The capacity of a water heater is an important consideration. The water heater should provide enough hot water at the busiest time of the day. We offer a wide variety of models including power-direct vent, power vent, direct vent, point-of-use, storage, and tankless systems. Fuel sources include: natural gas, propane gas, electric, oil, and solar. Comfort Zone is proud to carry American made Bradford White Water Heaters. We also service the water heaters we sell and install plus many more brands; please call us for any of your water heater needs.